ConstrainedStateSpace encapsulating a planner-agnostic atlas algorithm for planning on a constraint manifold. AtlasStateSpace implements an atlas-based methodology for constrained sampling-based planning, where the underlying constraint manifold is locally parameterized by charts (AtlasChart). The underlying constraint manifold can then be sampled and explored using the collection of these charts (an atlas). L. Jaillet and J. M. Porta, "Path Planning Under Kinematic Constraints by Rapidly Exploring Manifolds," in IEEE Transactions on Robotics, vol. 29, no. 1, pp. 105-117, Feb. 2013. DOI: 10.1109/TRO.2012.2222272. Definition at line 128 of file AtlasStateSpace.h. 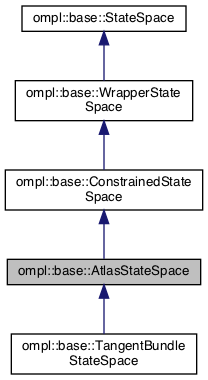 Definition at line 200 of file AtlasStateSpace.cpp. ompl::Exception if manifold seems degenerate here. Definition at line 251 of file AtlasStateSpace.cpp. Definition at line 182 of file AtlasStateSpace.h.